One day, years later, a friend of Bill's came to his house all excited and said, "Bill, I finally found the answer for you." In his hand he has a wartime copy of Strength and Health magazine. Bill could hardly believe his eyes when he looked through it and saw photographs of John Grimek, Clancy Ross, and Steve Reeves. From the minute he picked up the magazine, he knew he had found "the way". After Bill had been training for a while, his one goal in life was to get his picture in the Strength and Health magazine - in fact, any magazine. This single goal kept Bill busy on the weights until he graduated from high school. 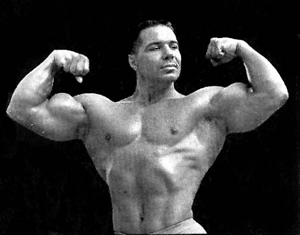 In 1950 Bill entered the U.S. Navy and subsequently had very little time to train until he was eventually stationed in San Diego, California, and joined Leo Stern's Gym. This was the turning point for Bill's future. He was now able to receive proper guidance with his training and had the necessary equipment and competition to push him to a higher set of goals. 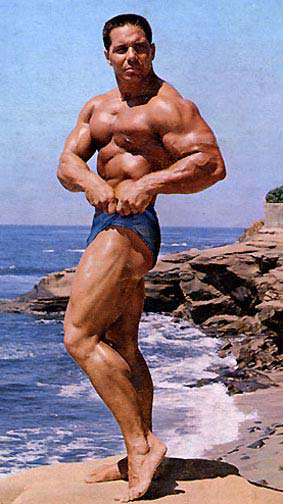 He entered his first physique contest in 1952 and placed third in the annual Mr. San Diego contest. 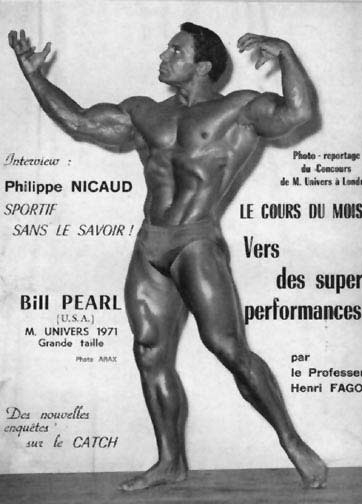 Come 1953 and Bill Pearl took the physique world by storm. He took the Mr. Oceanside, Mr. Southern California, Mr. California, Mr. America and Mr. Universe titles all in one year. With his enlistment in the navy finished in early 1954, Bill moved to Sacramento, California, and opened his first gym with the money he had saved by taking out war bonds the four years he was in the service - a grand total of $2,800.00. With the strong determination Bill has for succeeding, the gym was a tremendous success and overnight it was turning out some of the finest physiques the West Coast had ever seen. 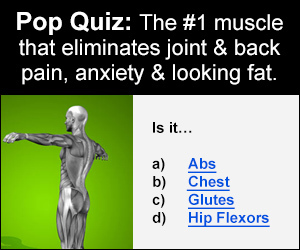 At one time he had expanded his gym operation to nine different health clubs scattered throughout Northern California. This, however, was not BILL. He was not able to get involved with the people on a personal basis. He therefore eventually cut back to one club and concentrated his efforts on making it the finest in Northern California. Bill's next victory in the physique would came in 1956 when he won the Mr. U.S.A. contest over the top 35 or 40 physique men in the country. This victory definitely put him at the top of the ladder in world competition, perhaps sharing the spotlight with the great Reg Park until around 1965. Following the 1956 Mr. U.S.A. win, Bill's next victory was his win at the 1961 Professional Mr. Universe contest in London, England, where he was the unanimous winner, receiving every first place vote. Because of personal problems, Bill sold his health club in Sacramento in 1962 and moved to Los Angeles, California, and purchased the famous George Redpath Gym. By this time Bill was in constant demand as a guest poser. He also had a fabulous strength act which included blowing up hot water bottles until they world burst, spike bending, chain breaking, and tearing auto license plates in half with his bare hands. He was also performing such lifting feats as a seated press behind neck with 310 lbs, military pressing 320 lbs, bench pressing 450 lbs, front squatting 500 lbs and full squatting 605 lbs at a body weight of 218 lbs. He was the most widely traveled Mr. America on record, having made trips around the world performing in nearly every foreign country, giving exhibitions, feats of strength, and lectures on physical fitness. His main theme was always to present himself as a gentleman and a spokesman fitting for the sport of bodybuilding. He appeared before crowds of 25,000 people in India, was the special hose guest of such distinguished men as J. Paul Getty and other top notables. Bill again took Britain by storm and won hands down, taking every first place vote. Most people admitted he was the world's Number One by far. He was in the greatest shape of his life at that time and some of the pictures published of Bill around this time were simply fantastic. Many bodybuilders believed Bill had secrets he was not sharing with the rest of the physique world. The following are Oscar Heidenstam's comments taken from the British publication, Health and Strength, dated October 26, 1967. "Let us be honest, focus was On the amazing Bill Pearl, and who, If anyone, could In any way match up to him... Surely the news that someone Like Pearl Is competing must inevitably deter those who come from a Long way and at considerable cost. Class 1 - All the way it was Pearl, here he was the supreme. Physique, posing, personality, the man himself, everything a champion should be. No superlative could describe this man; he was perfection itself, the master. It was easy for him, yet so inspiring. Who could be second to such a man? ... The Overall Professional Mr. Universe 1967 just had to be BILL PEARL and WAS THERE EVER A BETTER ONE?" Over the years Bill had long thought of opening a health club that would have universal appeal. His main idea was to separate the businessmen and light trainers for the bodybuilders and heavy powerlifters. This would mean that anyone, regardless of their present physical condition or goals, could use facilities that most appealed to them. His several years of consulting with North American Rockwell's Aerospace Program as athletic advisor to the Medical Staff, headed by the renowned Harold Morrison, M.D., had made Bill even more aware that proper weight training could improve nearly every person's life style if properly performed. With his contest days over - or so he thought - Bill wanted to stay in excellent health and devote all his time to his family, business, and helping others acquire superb health. THEN CAME THE BOMBSHELL! It was rumored through various physique magazines that Bill was afraid to compete in contests in which other star physiques were entered. He did not take these attacks seriously at first, as he did not think that anyone would expect him at over 40 years of age to do battle with these younger fellows in their twenties. He'd had his share of the limelight. Youth must be served. So it was the team of Pearl and Stern embarked on what would be the most vital contest in which Bill has ever competed. A lot of these fellows had something going for them that Bill did not and would not have - DRUGS. 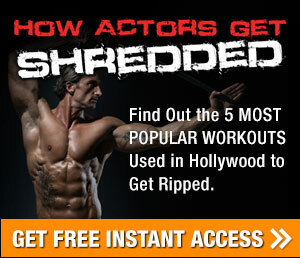 He absolutely refused to use anabolic steroids in his training methods. 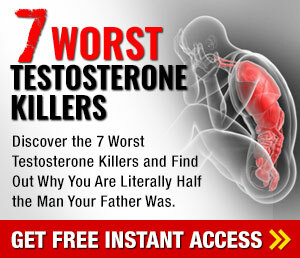 He firmly believes that while these drugs have an important place in the would of medicine, they are in no way meant to be used by the man who desires to improve his physique by lifting weights. In fact, this was to be a major factor in Bill's decision to have just one more try and compete against these people. It thus became a quest to prove to the same0minded bodybuilders throughout the world that resorting to the dangerous practice of using drugs is not only unnecessary - it is, in Bill's opinion, "sheer madness". On Friday, September 17, the pre-judging was held to determine who would be the amateur and professional Mr. Universe winners for 1971. Great physiques journeyed from all over the world in what would be the most hotly contested Mr. Universe ever. On the afternoon of the next day the famous Victoria Palace was packed to the doors, as usual, for the 23rd annual Mr. Universe contest. The capacity crowd enjoyed a fabulous show, and then waited with baited breath until at last the announcements were about to be made. "Ladies and gentlemen, the 1971 N.A.B.B.A. amateur Mr. Universe Is Ken Waller of the United States." This was a very popular decision and that grand old theater rang to resounding applause. You could almost hear a pin drop when M.C. Cecil Peck went on. "Ladies and Gentlemen, the 1971 N.A.B.B.A. professional Mr. Universe is... BILL PEARL!" That huge crowd went wild, cheering what must have been one of the most popular decisions since the contest began in 1948. A hush came over the crowd as Pearl walked toward the microphone to say a few words to his thousands of fans and a little man jumped to his feet and with his finest English accent began to shout at the top of his lungs, "PEARL IS KING." Returning home from England, after a brief tour of the Continent with his wife and the Sterns, Pearl put himself into virtual isolation from the physique world except for his business. He gave no exhibitions, no appearances, nothing. Being asked why he had taken this attitude, Bill replied, "My main reason for entering the 1971 Mr. Universe contest was to prove a point and I did. The trophy or the title meant very little to me. I wanted it forgotten and over. I actually felt strange onstage and felt I should have been there as a consular or a judge rather than a competitor. It reminded me of an old man trying to act like a kid. I felt I had my day and enough was enough." Bill started competing in bicycle racing in 1972 and purposely dropped his body weight to 185 lbs. Still continuing to weight train daily, he altered his training to fit his new sport. He rode and competed in races until 1975 and then returned to hard training again bringing his body weight back up to 225 pounds and dropped the bike riding to a weekend hobby. With very few photos and articles appearing in the physique magazines, plus the news the Pearl had stopped serious training, he was no longer a threat to the current flock of competitive body builders. Bill was now able to get at the goal he had wanted to attempt for years but could not find the time - getting all the weight training knowledge, material and data he had stored up on paper in hopes of helping others meet their goals in life. Bill's book Keys to The Inner Universe is a part of that goal. Bill still gets up regularly at 3:00 a.m. to train six days a week, works on his antique automobiles whenever he has a little spare time, and when he's not doing all that, he is on the road as a consultant for Life Fitness, sharing his expertise in the use of the fabulous Life Circuit exercise system and equipment. His home gym has been updated to include this innovative equipment and he is very enthusiastic about its capabilities for use in sports rehab and exercise. It is used in his gym by everyone who trains there, from neighbor ladies in their seventies, to the biggest, brawniest hulks that come up to challenge him.